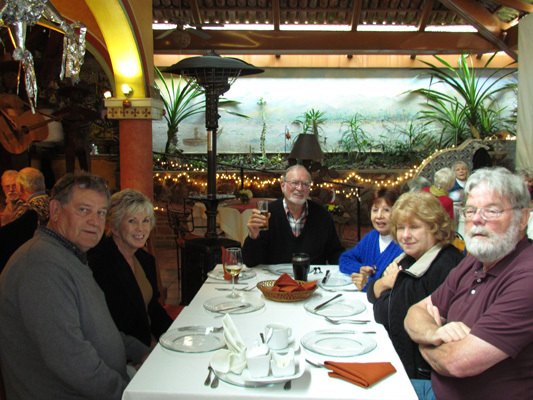 Our excursion through Canada and the eastern USA was highlighted by beautiful, warm and sunny times in southern Florida and a rather unusual cool spell during the holidays in Ajijic, Mexico. 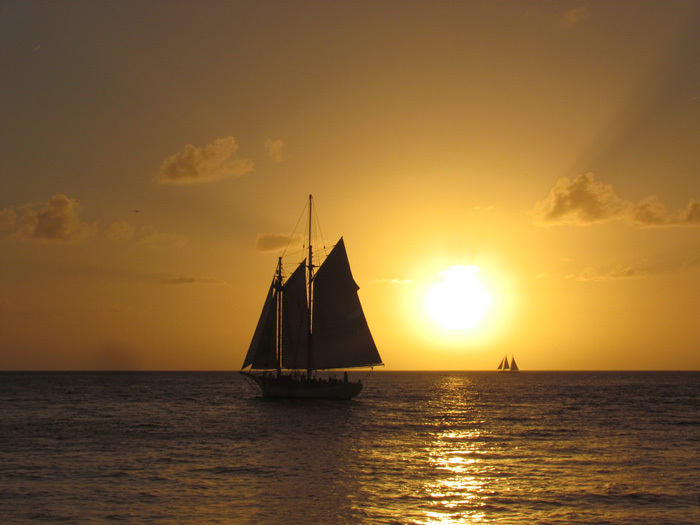 This picture is a view off the westernmost point of Key West Florida, where we were standing along with hundreds of other tourists trying to capture the most perfect picture. We think we got one of them!! 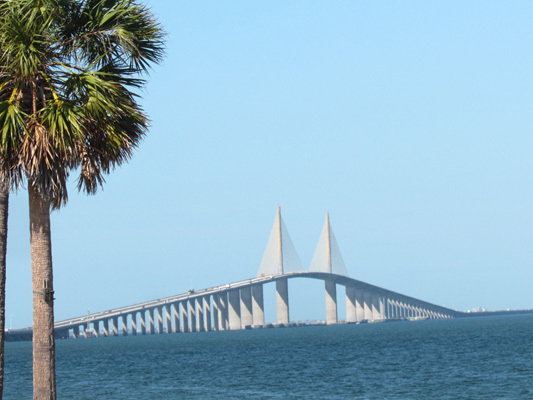 As we left mainland Florida, we crossed 42 bridges on our way to Key West. 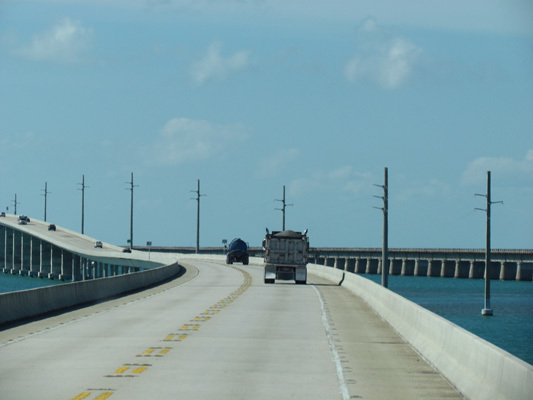 Here we are on the longest--called the Seven Mile Bridge. But what we found as spectacular was the abandoned bridge to the right that was built in the early 1900s by Henry Flagler, who left his fingerprints throughout Florida. 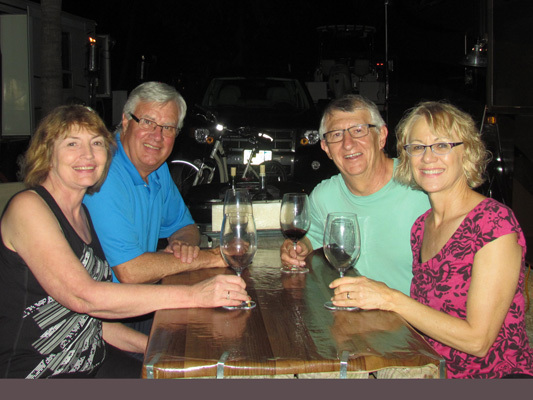 Dennis and Betty Steele left subzero weather in Bismarck to join us in what has become an annual tradition--spending a week RVing and exploring new sights together. 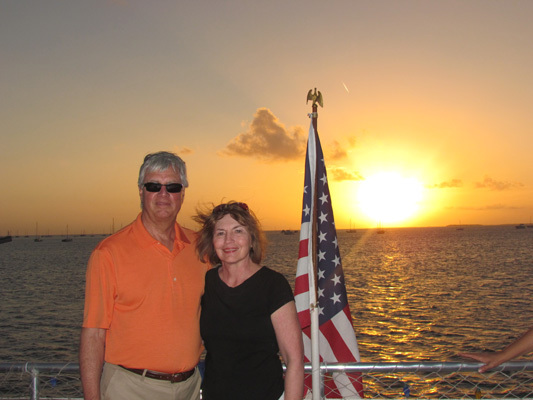 Here we are watching the sunset, where the picture above was taken. 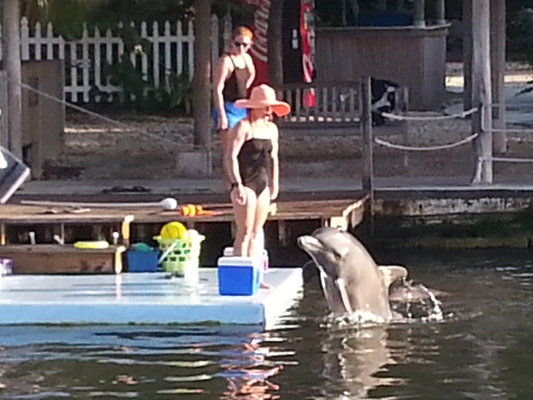 The high temperature in the Keys were in the 80+ all week. 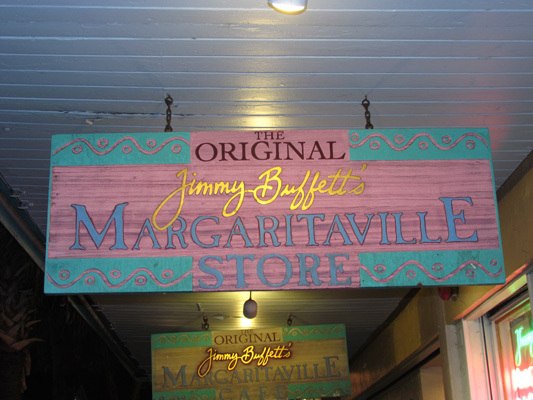 As we walked along the famed Duvall Street, we ran into Jimmy Buffet (his store that is). 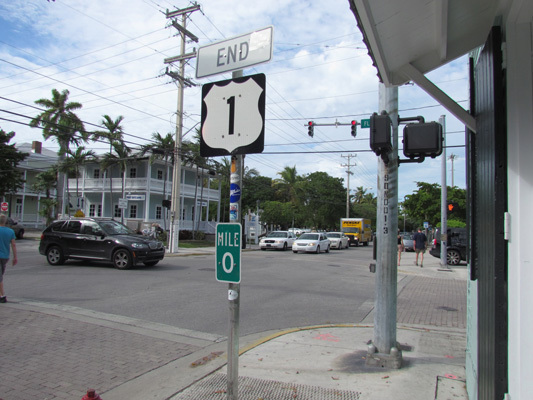 As a former resident of Key West, it is said that he learned the Caribbean beat here that led to some of his hits like Margaretville and Cheese Burgers in Paradise. 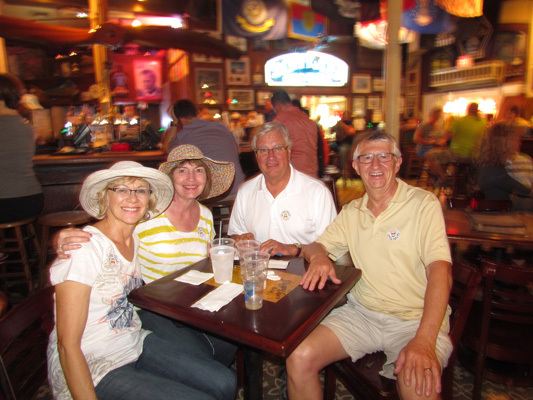 After a great day of touring, we went to Sloppy Joe's Bar for some drinks and some great Caribbean music. This is the bar that Ernest Hemmingway frequented when he lived and created his master pieces in Key West. 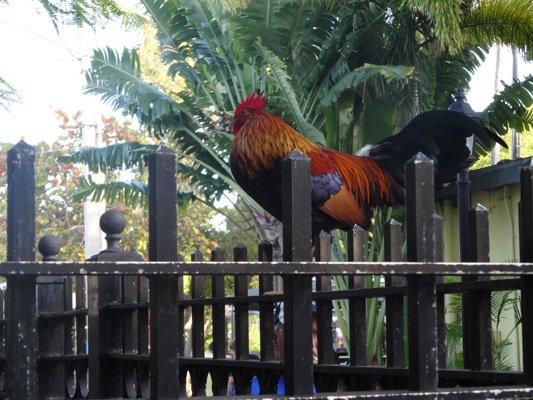 Who would have thunk that the bird of Key West would be a "Rooster?" They were everywhere! 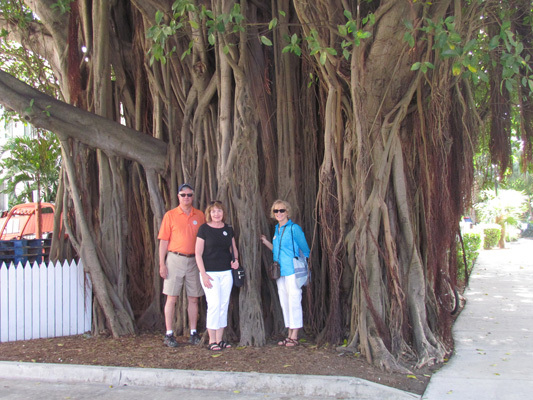 Key West is dotted with these massive Banyan trees. They have the largest Banyan tree in the US, however this is not it! 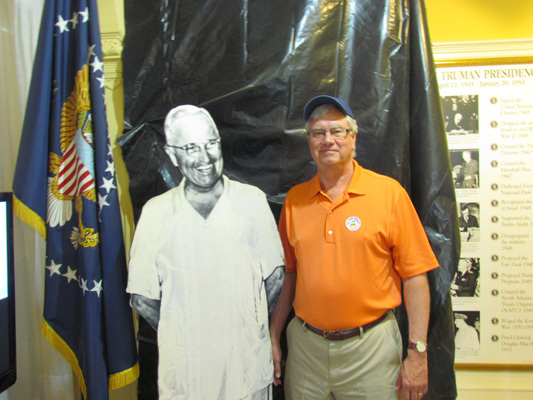 One of the most surprising places we toured was the Winter White House, used mostly by President Harry Truman. During his presidency, he used this place for working vacations 11 times. As we "relearned" of his vast accomplishments we all gained a greater appreciation of his role in world history. 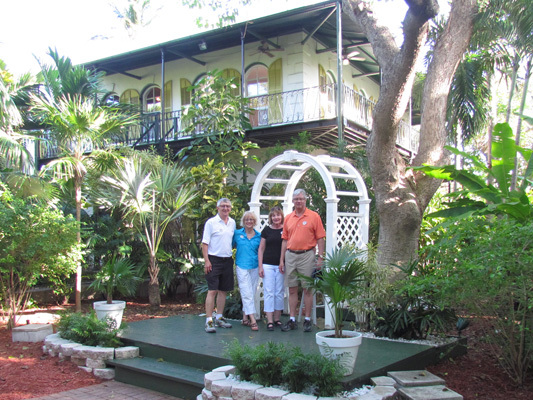 In the heart of Key West is where Ernest Hemmingway called home for 11 years. His beautiful home, writing studio and lush gardens is now a public museum. He loved cats, particularly polydactyl, those with six toes. The museum included a cat cemetery and is home to over 50 live cats, half with extra toes. 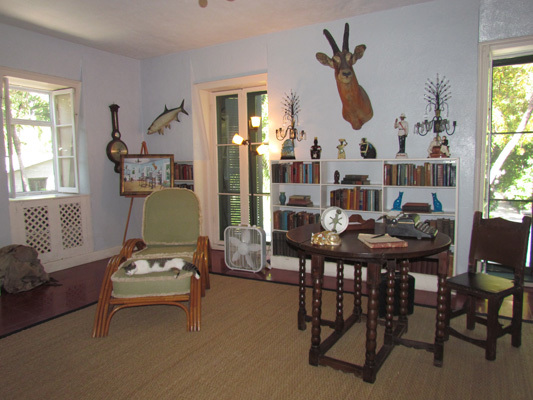 This is Hemmingway's writing studio, where he was said to arrive at 7:00 a.m. each morning regardless of how late he stayed out the night before. Here he wrote five books including one of his best seller--A Farewell To Arms. Note the Polydactyl on the chair. 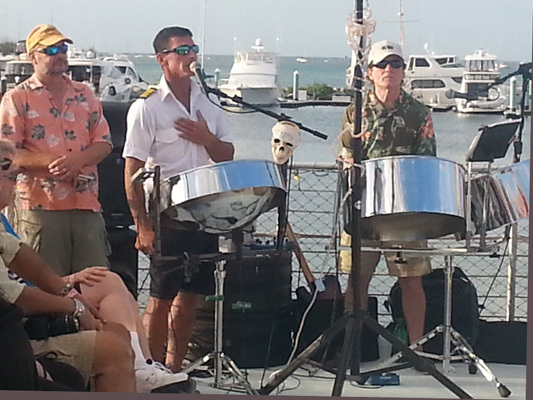 The Captain is giving instructions for our upcoming sunset dinner cruise off Key West. The evening's entertainment included some classic Buffet songs from these two musicians. The one on the right graduated from St. Mary's High school in Bismarck, where Dennis worked as a counselor (though not at the same time). We were the first two out on the dance floor, but we were not alone for long. By the end of the evening, Glorine was leading a Congo line around the upper deck of the cruiser. Hard to believe this was early December and we were all in short sleeve shirts enjoying yet another beautiful sunset overlooking the Gulf of Mexico. Dennis and Betty acclimated quite nicely. While we have all seen deer before, this one is quite unique. In addition to being on the endangered species list, it is only found in the Florida Keys and is the smallest deer in the world. This guy is fully grown, yet barely two foot tall. 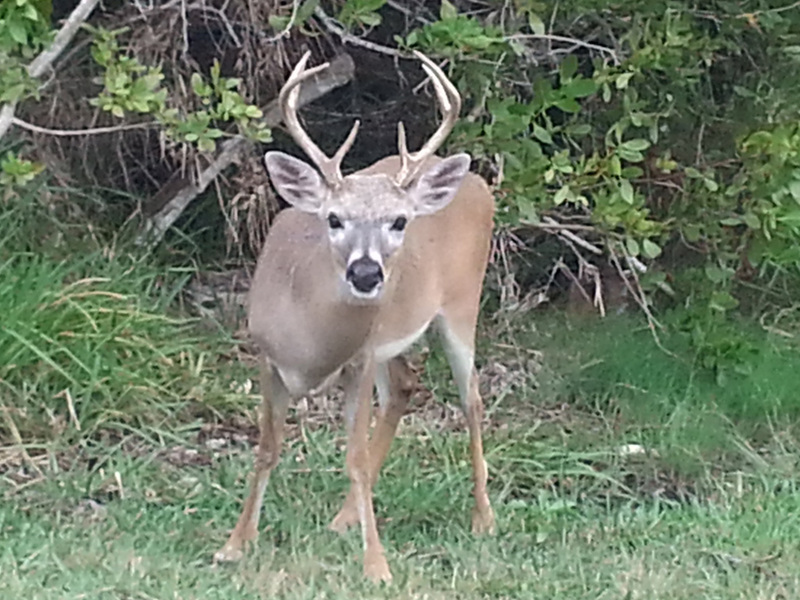 We stopped to eat at the No Name Bar near No Name Key, close to where we took the picture of the deer. 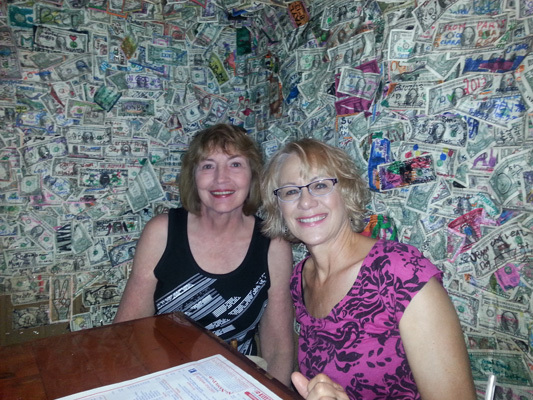 The bar was tastefully decorated with one dollar bills--wallpaper estimate is over $100,000. Between tours, we took time to relax at the RV, cook out a time or two and play some new card games. While it was nice and warm, the humidity made the inside of the RV with the air conditioning running much more pleasant. 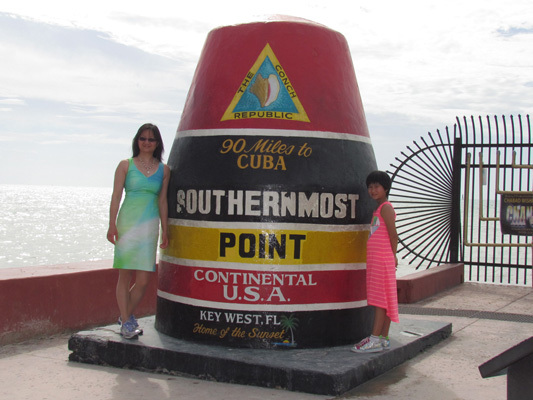 Key West is the largest and the southernmost point of the Keys. This marker is closer to Havana Cuba than it is to Miami, Florida and is a popular attraction for tourists, but the lineup for pictures was so long, we decided to pass. With our meanderings along the east coast of the USA this year, we drove this road in many of the states we toured and found this sign to be most interesting. Blue on blue! 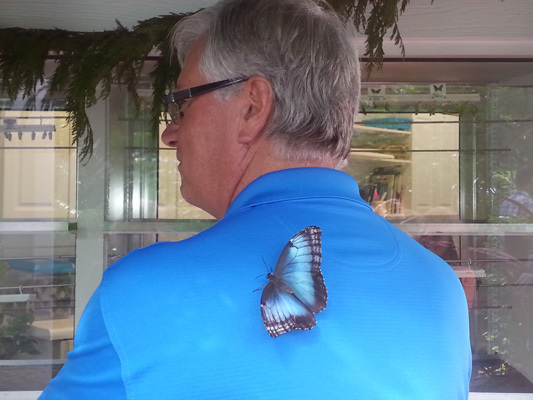 A surprising pleasant experience was touring the Key West Butterfly and Nature Conservatory with hundreds of butterflies and birds. 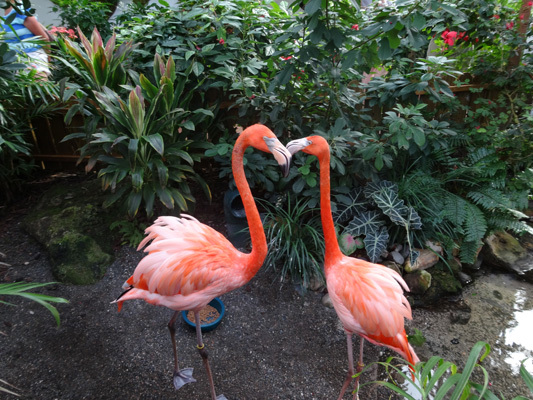 Not to be out done by all the colorful butterflies, the non-profit Nature Conservatory included dozens of colorful birds including these two kissing flamingoes. 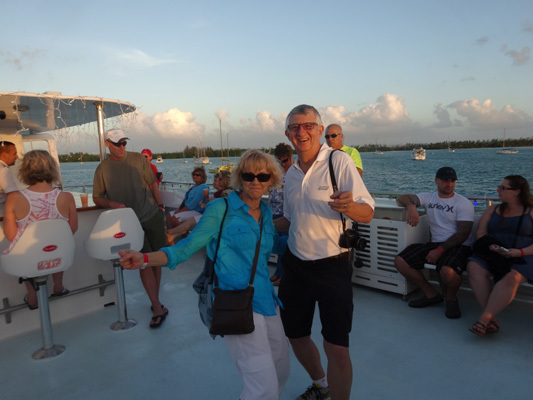 In Key Largo, we took a glass bottom boat tour of the Florida Reef, the only living coral barrier reef in the continental United States and the third largest coral barrier reef system in the world. 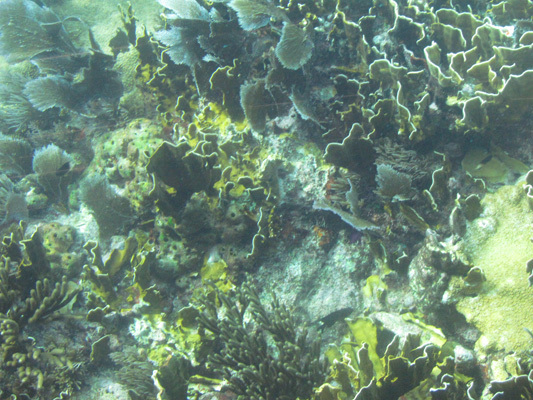 Along with beautiful coral we saw a shark, a barracuda and countless tropical fish. 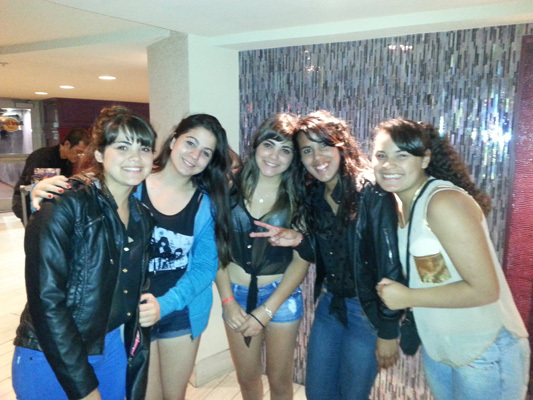 As we toured downtown Miami, we ran into these girls who were among 520 other girls from Argentina who came to Florida for a 12 day holiday to celebrate their Quinceanera (Spanish for fifteen-years-old), which marks the transition from childhood to young womanhood. They were having fun! CLICK HERE FOR A TOUR. 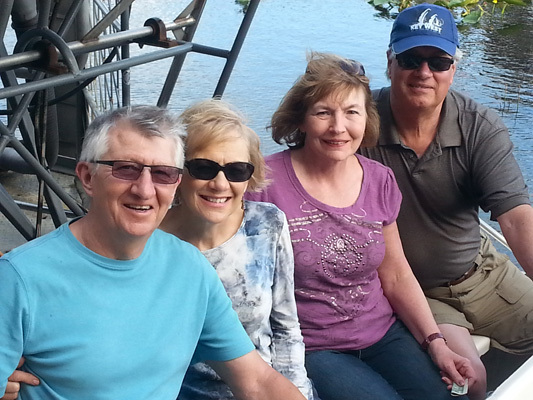 Preparing to take off on an airboat to tour the Everglades, North America's largest subtropical wetland eco-system. Both a World Heritage Site and an International Biosphere Reserve, the Everglades is actually a slow moving river that provides drinking water to 1/3 of all Floridians. 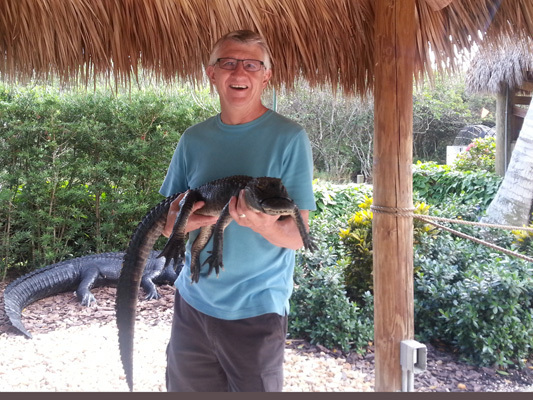 Meet Larry, the alligator! Here in the Everglades National Park, alligators are only one of 40 animals that call this home. The Florida Panther, is another one, but currently on the endangered list. It is the only place on earth that American alligators and crocodiles coexist in the wild. 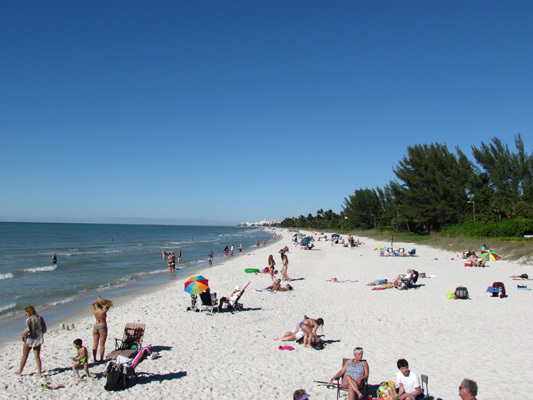 After Dennis and Betty left for their trip home, we moved the RV to Naples, Florida for a week. 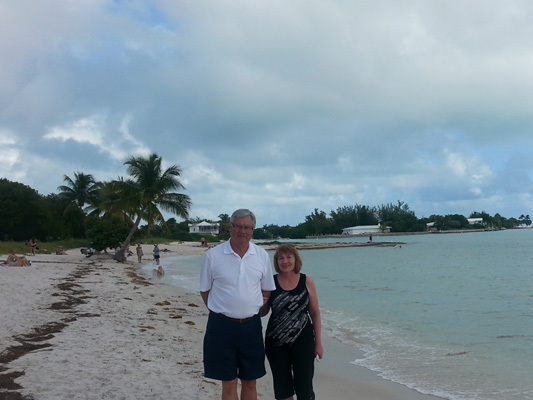 Here we are taking in the beach near the famous Naples Pier. With our upcoming trip to Ajijic, we limited our touring of the area and focused our time on packing and prepping the RV for a month in storage. 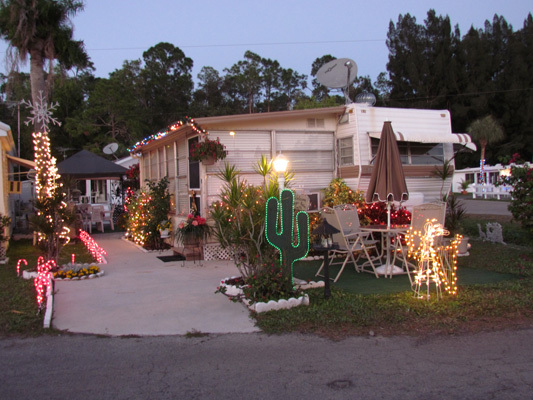 On an evening stroll through the RV Park we saw lots of snowbirds getting their rigs all decked out for the holidays. We decided that these folk won the Christmas decoration competition. During our Explore America Tour, we gained a greater appreciation (if not a fascination) with bridges. This one spans Tampa Bay along US Highway 19, in route to Hudson Florida, where our RV was going to spend a month while we were in Mexico. Welcome to Casita de Sonrisa (little house with a smile), our home for a month. 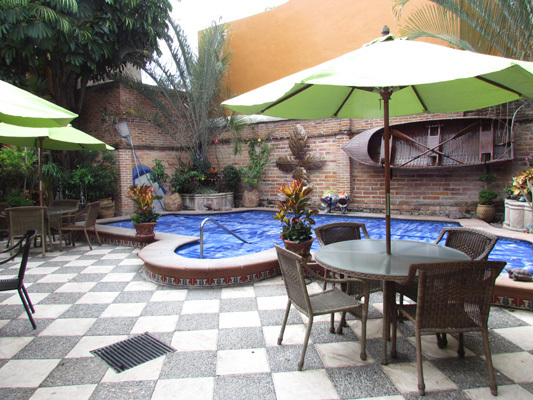 It is located inside a B and B and is the only unit with a full kitchen, dining and living area. 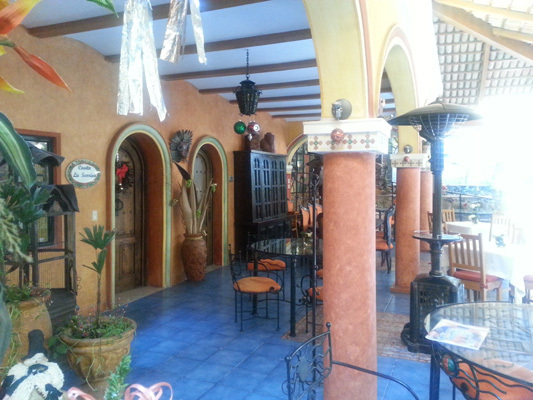 A new restaurant (Ninette's) opened this past summer and uses this space next to our casita for lunches and dinners. 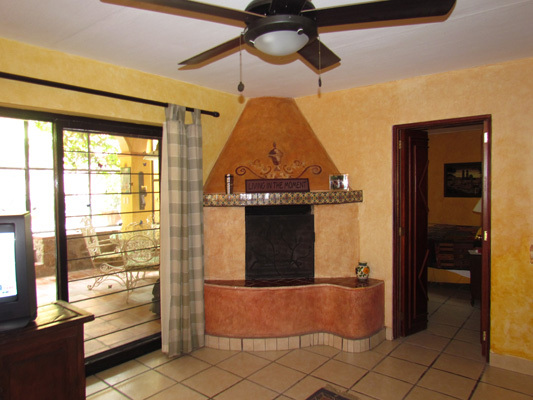 Our casita has one bedroom with a master bath and includes a fireplace (something that most Mexican homes in the area do not have) along with a private patio leading to a swimming pool and common areas. The pool was cool to look at, but too cold to swim in. We never figured how to get the boat in the water either. 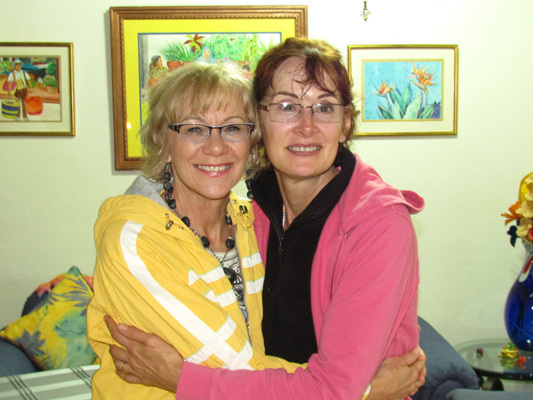 These are among twenty friends who joined us for Sunday brunch at Ninette's Restaurant. Food was great, but the staff were a bit overwhelmed by the number of people we invited. Johnnie Momma's is a new venue in town. 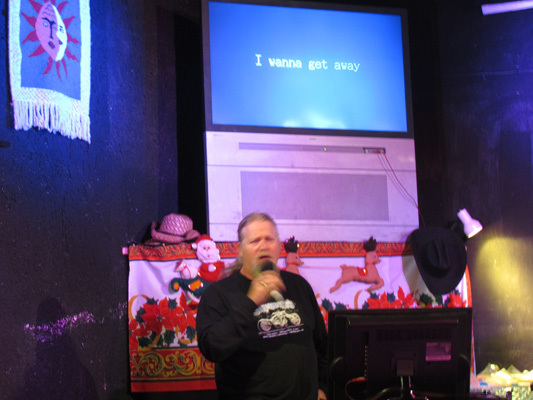 Two nights a week they have Karaoke. While we were not looking forward to it, we were quite surprised by the local talent--three out of four could stay in tune. And they served up great hamburgers also. 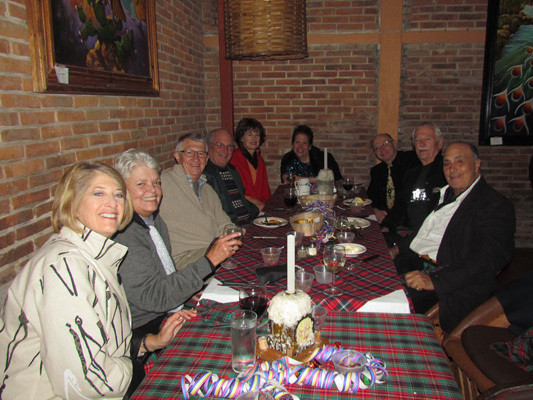 Thanks to Jim and Margo Jones (next to Larry), we had a wonderful Christmas. 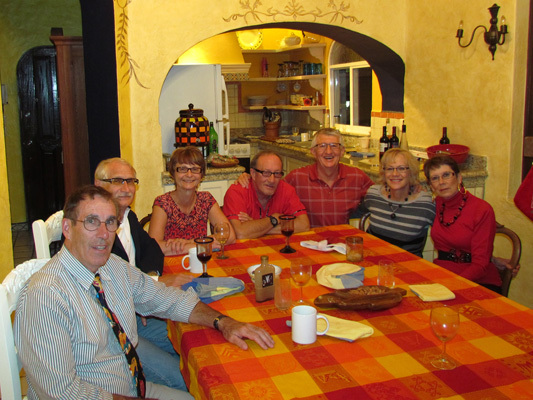 We met Jim and Margo last year, through friends Brian and Marilyn Mitchell from Regina, Canada and have become regulars within our network of friends. The cruisers are home. 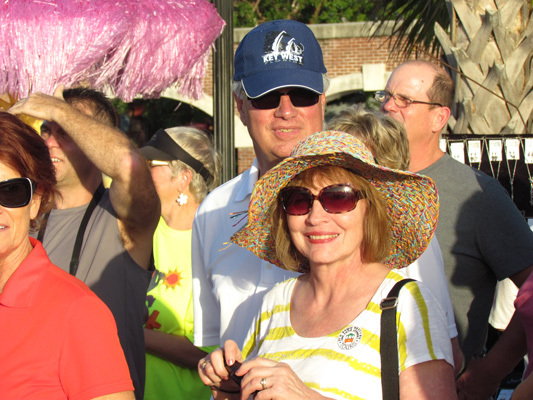 After us being in Ajijic for a few days, Maureen and Wayne returned from their third cruise since we saw them last spring. These included the Mediterranean, Hawaii and their latest through the Panama Canal and the western coast of South America. Nice to be together. With our casita located in the heart of the village, this scene would repeat itself often throughout our short stay in Ajijic--entertaining wonderful friends enjoying our time over Glorine's new Kiwi Gin Tonic recipe, deep in conversation, a movie or in a competitive game of Mexican Train. 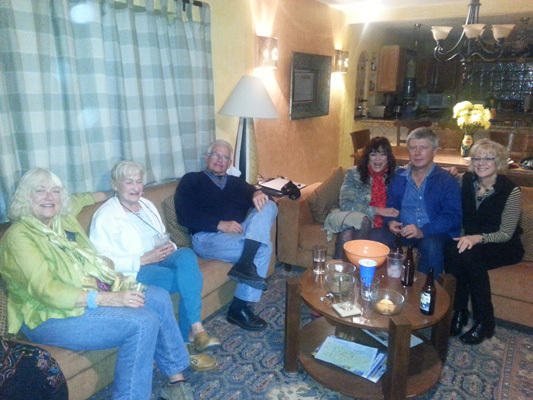 We rang in the New Years with Wayne and Maureen and friends Randy and Andy along with some of their friends. 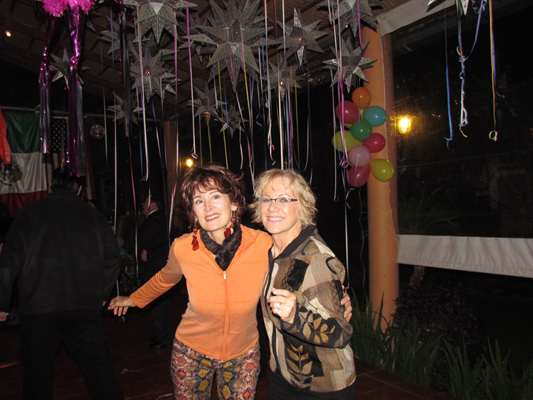 It was a cool evening, but the music got us out dancing, which warmed things up pretty quick. After we toasted in the New Year and ate the traditional 12 grapes, Glorine and Maureen kept the celebration going wee into the morning--for people our age, that meant about 12:15 am. The rest of us discussed "Where did the year go?"